Get ready for 10 Days of Frankenweenie as Disney conjures some spooky Halloween magic. With Halloween less than a month away, you can expect a bunch of video games and movies inspired by the creepy holiday. Now at first, Disney's Where's My Water? Free didn't seem like an ideal candidate, but inject some levels inspired by Tim Burton's Frankenweenie, and bam, instant Halloween goodness. As it turns out, Disney did exactly that with a free update that gives players a 10 Days of Frankenweenie level pack inspired by the upcoming animated film, arriving in theaters October 17. 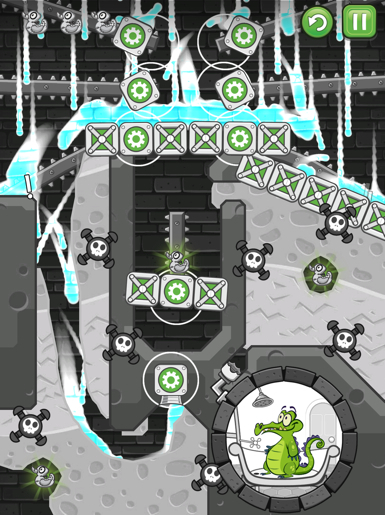 Once downloaded, fans will enjoy black and white stages that pay homage to the stop-motion flick's stylish appearance, along with a movie-themed comic starring Sparky, the undead pooch. Not only that, but the update adds collectibles and a Danny Elfman-esque theme featuring a children's choir, spooky sound effects and cool music mixes. On that note, watch the official 10 Days of Frankenweenie trailer below, and don't forget to download/update Where's My Water? Free.